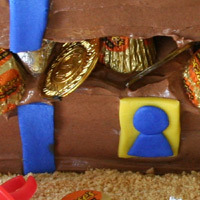 The kids loved this cake! 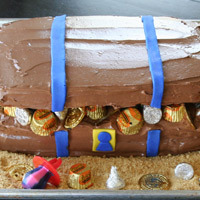 It's a chocolate cake with chocolate frosting on top of graham cracker crumbs, surrounded by candy and pirate treasure! Make the cake and cut in half. Place one half on a large rimmed baking sheet. Frost the top and sides. 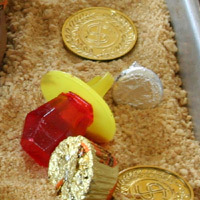 Position some of the candy along one of the long sides. Frost the sides and top of the other half of the cake. Carefully place it on the first half. Roll out and cut the fondant. Position it for the straps and lock. Spread the graham cracker crumbs around the sides of the cake. 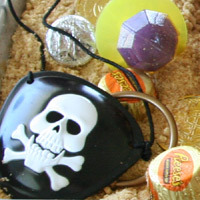 Decorate with the remaining candy and accessories.